Malayalam Manorama being a household name, most of its publications is being greeted with full heart by the malayali community living around the world. May it be the manorama daily or Vanita, readers wish to follow all the magazines and other periodicals circulated by their favourite publishing house, Malayala Manorama. Manorama Weekly with 6 lakh prints is one of the largest circulated weekly magazine in India. Being considered as Kerala's best family entertainment magazine, this is truly a companion of teenagers and readers of other ages. Started publishing from 1937, this weekly entertainer is well popular in India and abroad through its digital edition. The highlight of this magazine would be the serialized novels, Cartoons, Jokes, utility columns and other regular stories which can serve the readers as a delicious pizza. Other features like stories for children, cinema section, comedy sections, recipe sections, short stories, tips, original personal stories, and interviews with famous personalities make 'manorama weekly' popular among the readers. Open hearted interviews with popular film stars would enable the readers to know the inner side of their favourite actors. Astrological predictions, answer from the doctor, poems, kids sections gives a full satisfaction to its readers. As each issue is creamed with innovative content, it gives much refreshment from top to bottom. A team of youngsters energetically work behind the screen which brought success to this publication. The weekly which comes with an affordable price is the favourite among the common people. The content of this weekly is well discussed among the people while college students share the ideas with their friends. Having much demand among the among homemakers and not-so-highly educated women in the state, 'Manorama weekly' will be the best choice for those who wish to keep them entertained for a whole week. This weekly is highly recommended to passionate readers those who want to keep freshness and be cheery always. Vanitha Veedu, a publication from the Malayala Manorama group is a complete family magazine which features about home and interior. Unlike other magazines of the genre, each edition of Vanitha Veedu is a complete treat for the readers packed with amazing reservoir of plans, articles and tips on homes. Started in 2007, Vanitha Veedu is compiled by experts and covers every aspect of building a home, modernizing or beautifying it. 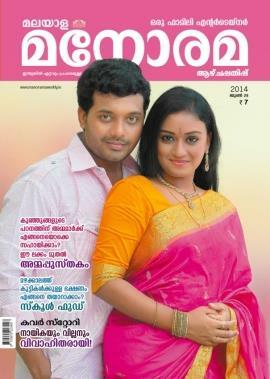 Read more to know about Vanitha Veedu malayalam magazine.